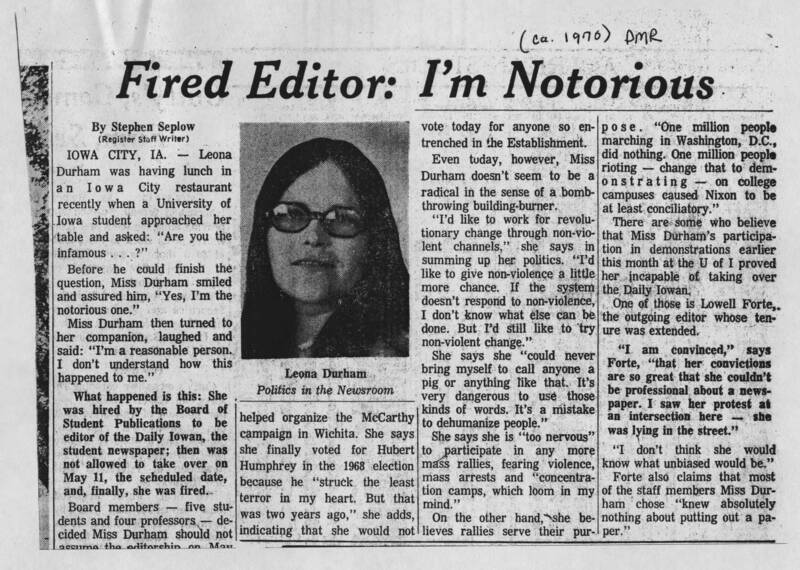 DIY History | Transcribe | Social Justice | Daily Iowan and Leona Durham controversy, 1970-1972 | Des Moines Register Article: "Fired Editor: I'm Notorious"
Des Moines Register Article: "Fired Editor: I'm Notorious"
(ca. 1970) DMR Fired Editor: I'm Notorious By Stephen Seplow (Register Staff Writer) IOWA CITY, IA -- Leona Durham was having lunch in an Iowa City restaurant recently when a University of Iowa student approached her and asked: "Are you the infamous...?" Before he could finish the question, Miss Durham smiled and assured him, "Yes, I'm the notorious one." Miss Durham then turned to her companion, laughed and said: "I'm a reasonable person. I don't understand how this happened to me." What happened is this: She was hired by the Board of Student Publications to be editor of the Daily Iowan, the student newspaper; then was not allowed to take over on May 11, the scheduled date, and, finally, she was fired. Board members - five students and four professors - decided Miss Durham should not assume the editorship on [this column was cut off] helped organize the McCarthy campaign in Wichita. She says she finally voted for Hubert Humphrey in the 1968 election because he "struck the least terror in my heart. But that was two years ago," she adds, indicating that she would not vote for anyone so entrenched in the Establishment. Even today, however, Miss Durham doesn't seem to be a radical in the sense of a bomb-throwing building-burner. "I'd like to work for revolutionary change through non-violent channels,: she says in summing up her politics. "I'd like to give non-violence a little more chance. If the system doesn't respond to non-violence, I don't know what else can be done. But I'd still like to try non-violent change." She says she "could never bring myself to call anyone a pig or anything like that. It's very dangerous to use those kinds of words. It's a mistake to dehumanize people." She says she is "too nervous" to participate in any more mass rallies, fearing violence, mass arrests and "concentration camps, which loom in my mind." On the other hand she believes rallies serve their purpose. "One million people marching in Washington, D.C., did nothing. One million people rioting - change that to demonstrating - on college campuses caused Nixon to be at least conciliatory. There are some who believe that Miss Durham's participation in demonstrations earlier this month at the U of I proved her incapable of taking over the Daily Iowan. One of those is Lowell Forte, the outgoing editor whose tenure was extended. "I am convinced," says Forte, "that her convictions are so great that she couldn't be professional about a newspaper. I saw her protest at an intersection here - she was lying in the street." "I don't think she would know what unbiased would be." Forte also claims that most of the staff members Miss Durham chose "knew absolutely nothing about putting out a paper."